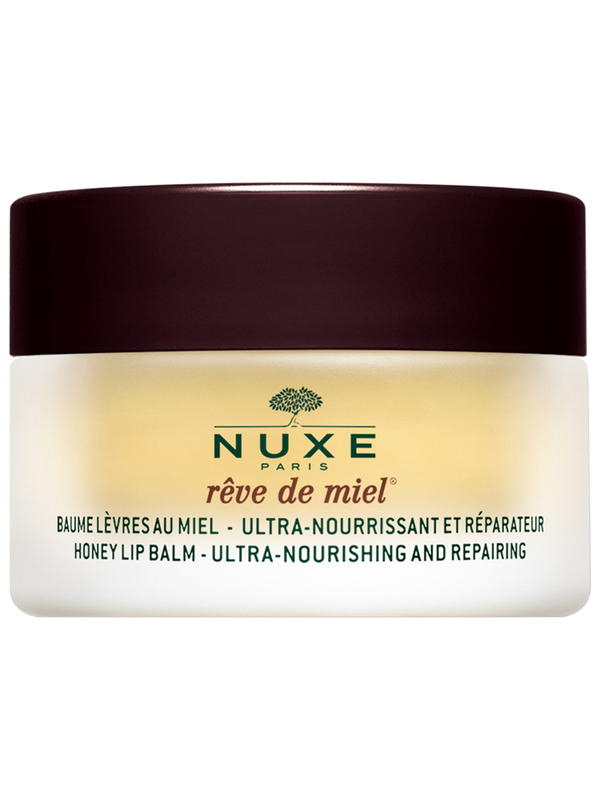 Nuxe Rêve de Miel Honey Lip Balm Ultra-Nourishing and Repairing 15g is consistent and complete. 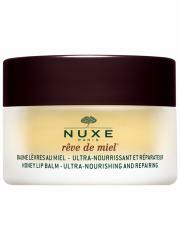 It nourishes, repairs and relieves the most damaged and desiccated lips. The lips are flexible, soft and smooth. This care is addressed to all the family, even children from 36 months. Apply each day, winter or summer. Indication: Lips care, lips contour, damaged lips. Cera Alba/Beeswax, Butyrospermum Parkii (Shea) Butter, Olus Oil/Vegetable Oil, Lecithin, Behenoxy Dimethicone, Prunus Amygdalus Dulcis (Sweet Almond) Oil, Mel/Honey, Dimethicone, Caprylic/Capric Triglyceride, Citrus Grandis (Grapefruit) Peel Oil, Hydrogenated Vegetable Oil, Rosa Moschata Seed Oil, Tocopheryl Acetate, Tocopherol, Citrus Limon (Lemon) Peel Oil, Glyceryl Caprylate, Allantoin, Calendula Officinalis Flower Extract, Helianthus Annuus (Sunflower) Seed Oil, Propolis Extract, Citric Acid, Limonene, Citral, Linalool, Geraniol. Active Ingredients: Miel d'Acacia 5%, Beurre de Karité 13%, Huiles Végétales (Rosier du Chili, Amande Douce) 9,5%, Essence de Pamplemousse 2,5%, Vitamine E 1%.